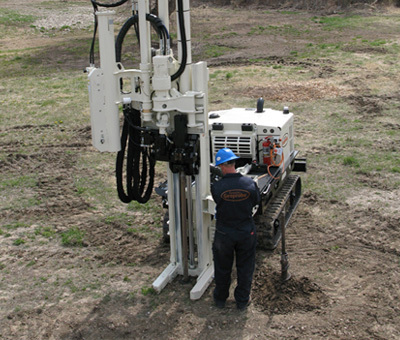 We use the most recent tooling available from Geoprobe© to complete soil borings for the purpose of collecting soil and groundwater samples. Recent advances in the tooling provides for increased efficiency and sample integrity. 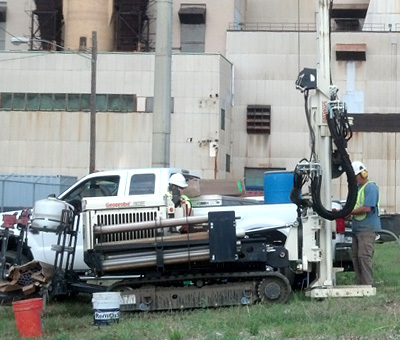 GSI primarily uses dual tube sampling systems to complete soil sampling while casing the borehole. This allows for more accurate logging and sampling by casing off any sidewall slough. In addition, the outer casing effectively seals the probe hole when sampling through perched water tables. These factors mean that sample cross contamination is virtually eliminated. Different dual tube systems are employed depending on sampling requirements and goals. 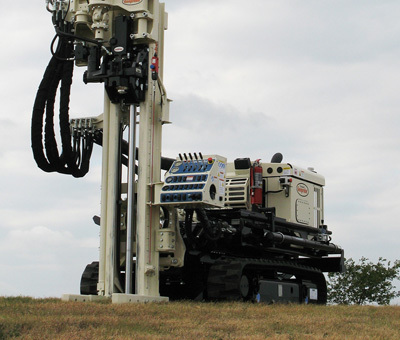 The updated MC5 macro core sampling systems are still utilized for shallow sampling jobs as well as some challenging formations and specific goals. All of these soil sampling systems retrieve the soil cores in clear PVC liners. Our operators will safely open the liners for you to facilitate screening and sampling. Tooling systems we regularly employ are highlighted below. Contact GSI to learn the benefits of each system and how they can help you achieve your site goals. Dual Tube 22 - Uses a 2.25" casing and collects a 1.25" soil core. Typically used for most soil sampling and small diameter temporary water sampling points. Dual Tube 32 - Uses 3.25" casing and collects a 1.85" soil core. Used for installation of prepack wells and soil cores deep into the water table. Dual Tube 45 - Uses 4.5" casing and collects a 3" diameter soil core. Used for installation of 2" prepack wells and conventional well, and when high volume of soil is required. MC5 - Collects a 1.5" soil core and is typically used for shallow sampling and challenging formations. Similar to soil sampling, GSI has many tools in its "tool bag" to achieve your groundwater sampling needs. Temporary PVC Well Screen - If a water sample is required after the soil boring is completed, PVC well screen and riser can usually be installed through the dual tube casing. Screen Point samplers are used to collect discrete and multilevel groundwater samples when no soil sampling is required. Prepack Monitoring wells- GSI is able to install prepack monitoring wells to ASTM specs from .75" inside diameter to 2" diameter using dual tube casing systems. We have installed 1.5" prepack wells as deep as 75' with shallow ground water at 6'. Conventional wells - GSI is capable of installing 2" diameter monitoring wells with dual tube casing as well as using hollow stem augers to install conventional 2" and 4" monitoring wells to maximum depth of 45 to 50'. GSI will provide peristaltic pumps and/or tubing check valves for the collection of groundwater samples. In support of our soil and groundwater sampling services, GSI is capable of borehole clearance using softdig/airknife technology, and can provide monitoring well abandonment for wells ranging from .75" to 4".